This sounds delicious. We are well into our Asparagus season here in the southeast US but I find we cannot get enough! I got hold of some expensive French pinky-tipped white asparagus the other day. Wanting to make more of it than usual, I made a gratin using a French recipe. I thought it very disappointing, but I like the sound of your carbonara. I won't be buying the white stuff again though, just gimme green. I quite like white asparagus Sarah but it does have a different appeal. All asparagus depends how fresh you can get it. Just picked - as with most veg - is always best. Sounds as if you're enjoying it, Colleen! 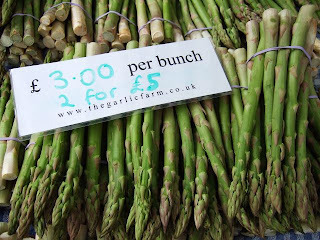 A chef in the papers this weekend pointed out that just because Asparagus has come earlier doesn't necessarily mean there will be a lot more of it! Maybe we should eat it whilst we can before it is sold out? I had great fun with the aspargus this season. I still have some frozen. In case I get a real craving. ;-) I love them both green and white.